I have over 30 years experience in the trade. I began it all with Ford in Cheshire where I completed my apprenticeship. Throughout the years I have had main dealer experience with Seat, VW and Vauxhall and also with various independent garages so it has offered me an all-round experience for all makes and models. After a number of years of deliberation I set-up MOTATRUST in 2016. 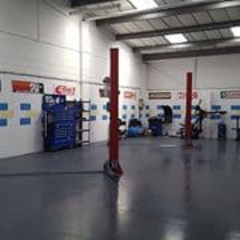 The garage offers full workshop facilities and has 2 bays. We offer a free collection/delivery service in the local area. We offer services, mot, repair, tyres, exhausts, batteries, brakes and suspension..are some of our services. Don’t get me wrong he was lovely but he called me up with in the first hour saying he couldn’t find my lock nut and that they were specific Nissan bolts , charged me and an extra 80 pound ! Which was fair enough to then text me the next day to say my car was ready and when I arrive there was a fault with the car that wasnt there befor ! He was nice enough to keep it and fix it for free but when I pick the car up the next day I’m locked out of the Nissan connect , so I look for my car manual and low and behold In the glove box is the original Nissan lock nut ! So I was charged an extra 80 for nothing and I’m now waiting for Nissan to try and sort my code ! Safe to say I won’t use clickmymechanic again. Arrived on time. Mechanic was friendly and made the experience stress free and easy. Very happy worth the work. USED MOTORTRUST,WOULD USE THEM AGAIN,HONEST AND RELIABLE. DID NOT COST AS MUCH AS I THOUHGHT.VERY HAPPY WITH THE WORK CARRIED OUT. From the off my experience of using not only Click-mechanic but Motatrust Plymouth (Ivybridge) has been simple, straightforward and successful. The mechanic arrived ahead of the scheduled time and i was out but a quick phone call from him to say he was outside my property was a nice surprise. all the work was carried out as requested with clear guidance on what was required in the near future (work was a) brake pads front and rear b) full service c) MOT). And it due to me not knowing where my service booklet was he extended his services to me by way of ringing him when i find it so he can stamp it. great job guys keep up the good work! in summary this service is fast, easy but most importantly trustworthy. i will be definitely using this service in the future. This is a great service. Did exactly what you said you would do at such short notice, and over a weekend. I will definitely use your service again for everything vehicle related, service, repairs, MOT'S. Top draw service. I didn't get his name but he didn't know anything about Saabs, although he said he had a mate who did. Either way his verdict on a common turbo blue smoke problem was that "it might be piston rings" when in fact it is likely to be an oil seal. I paid £46 for this 'diagnosis' and clickmechanic will not refund it. Clickmechanic suggested it was best to have a service before the MOT so that problems can be fixed beforehand. Unfortunately I fell for that and paid £116. It appears that a light bulb was changed. The mechanic should have looked over the car prior to the MOT and then advise on whether a service is appropriate or perhaps the money should have gone on repairing MOT failure items. The MOT failure was catastrophic so I was surprised to then receive a quote of just £750 to fix everything. This, plus the £250 taken off the card for the MOT, diagnosis and service (why change the oil on an engine with a "major oil leak"? Punctuality? The vehicle was to be collected between 8 to 10 am. Brilliant - all done on time to a high standard - no faults at all. Hi ben, many thanks for your feedback it was a pleasure. MOTATRUST.